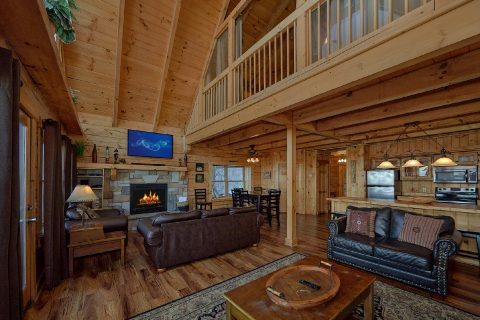 Find yourself at a luxury Smoky Mountain Village Resort cabin for a fantastic vacation with those who matter most! 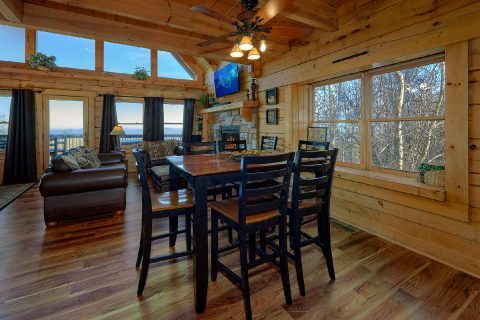 "Gatlinburg Splash" is an excellent 3 bedroom cabin that sleeps up to 12 guests in comfort. 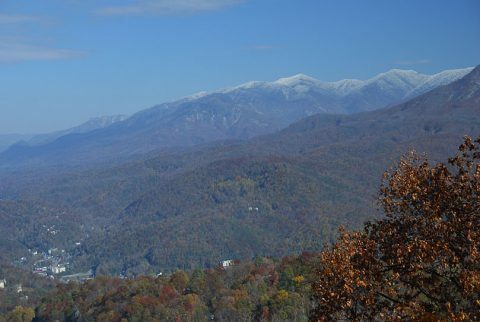 Nestled high in the mountains above Gatlinburg, this rental also places vacationers close to Ober Ski Mountain, Pigeon Forge, and the Great Smoky Mountains National Park! 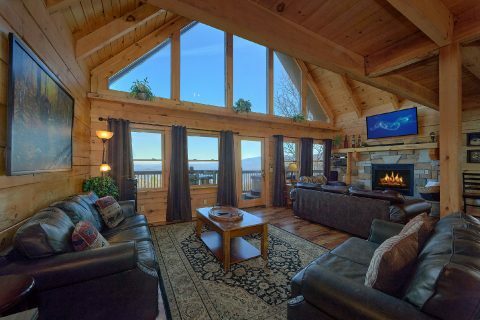 Even better, this rental has luxury amenities like comfortable furnishings, a hot tub, game room, and a private indoor swimming pool! 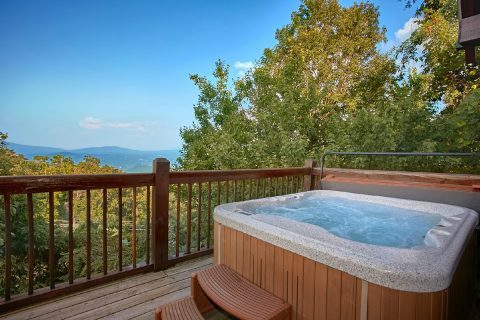 When you aren't having a thrilling time exploring the scenic Smokies of Tennessee, you'll love relaxing at this premium cabin with everything you need for an incredible stay. 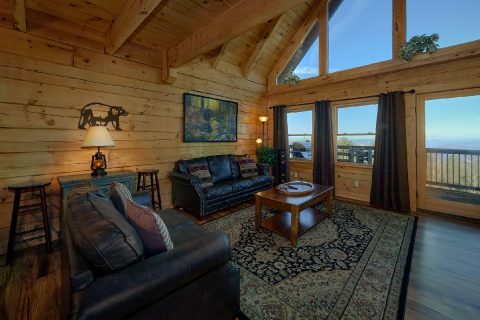 In the main living area, you can admire your cabin's awesome view through large picture windows. 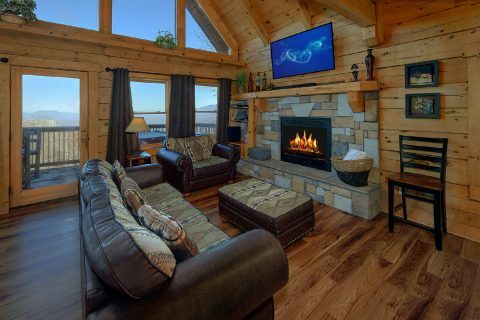 The main living area is a great place to watch a movie on your vacation since it comes complete with a 52" HDTV, Blu-Ray player, surround sound, a gas fireplace and cozy leather furnishings. 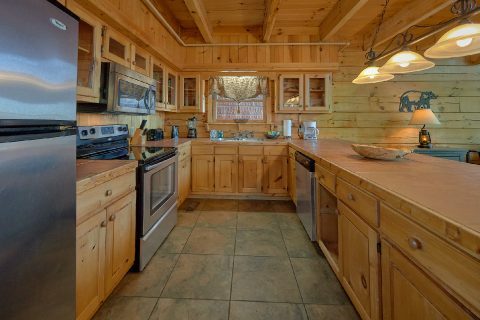 In the nearby kitchen area, you'll find everything needed for making delicious meals in your home away from home. Gather around the dining table with seating for 6 guests. 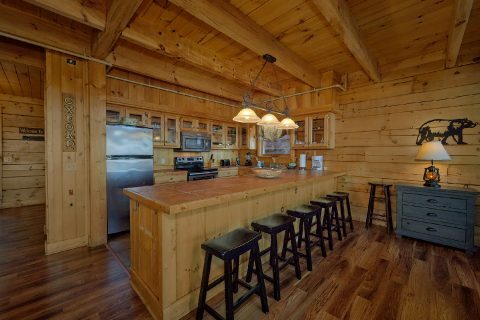 A kitchen island provides additional seating for 5. 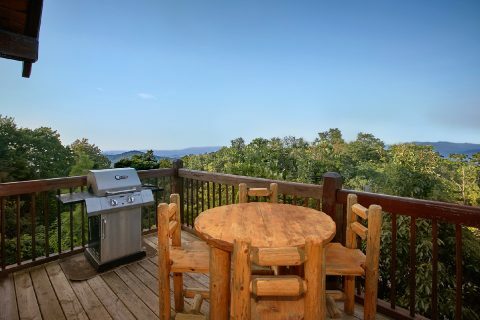 There's also a gas grill for enjoying cooking in the great outdoors. 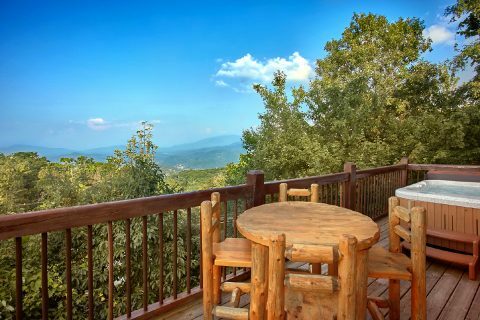 In the morning, step out onto your cabin's deck to sip your cup of coffee while you sit back in a rocker to admire the mountain view. 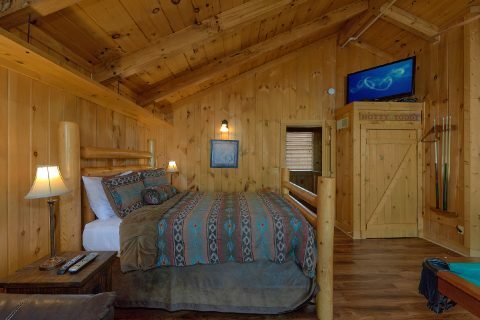 Upstairs, you'll find the first of your cabin's 3 bedrooms with a log-frame queen bed. 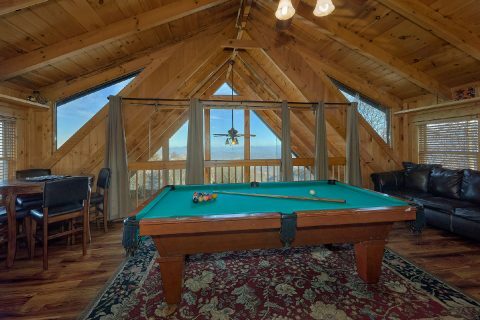 This room also serves as your rental's game room with a pool table. You won't believe the inspiring mountain view you can enjoy from this room's large windows. For even more entertainment, this room offers a 42" HDTV, Blu-Ray, CD player, an Ipod Dock, board games, and a pub table with seating for four. 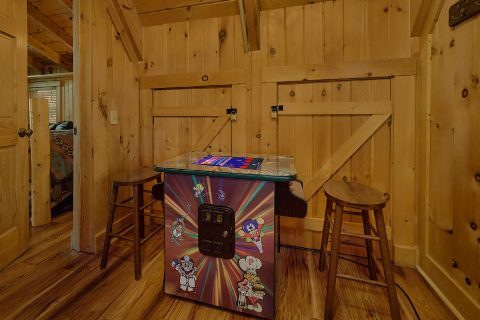 You'll also enjoy a sit-down arcade game that comes with 60 classic arcade games for hours of fun and friendly competition. 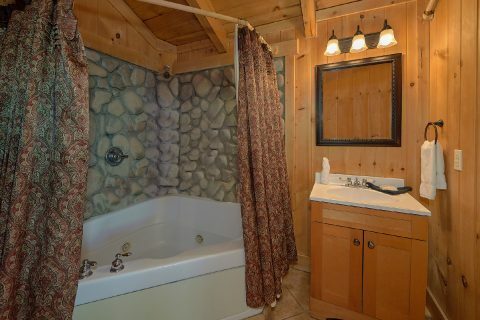 The full bathroom on this level also comes with a jetted tub. 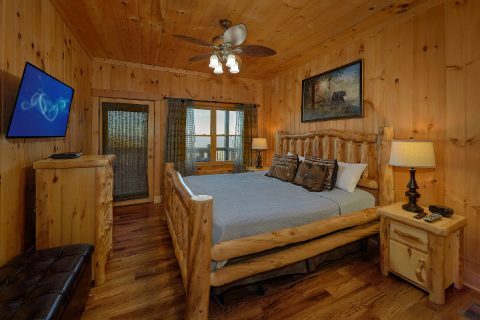 You'll find your cabin's other bedrooms downstairs that each offer king-size beds, TVs, and access to private baths with jetted tubs. 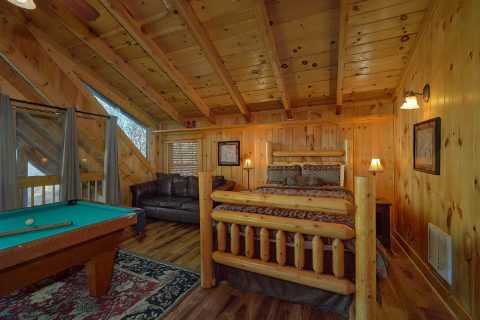 Additionally, these rooms offer access to a covered lower deck with rockers. From this deck, you can take the stairs to the lower level of your cabin with the indoor swimming pool. 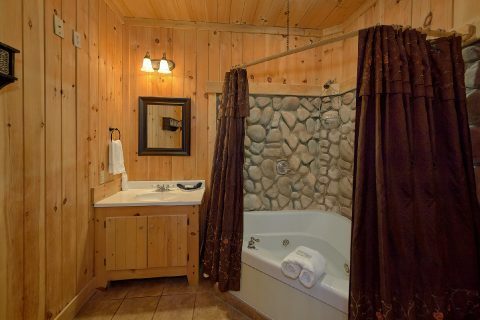 This room also comes complete with a sofa, love seat, IPOD Dock, CD player, and a bathroom with a shower. 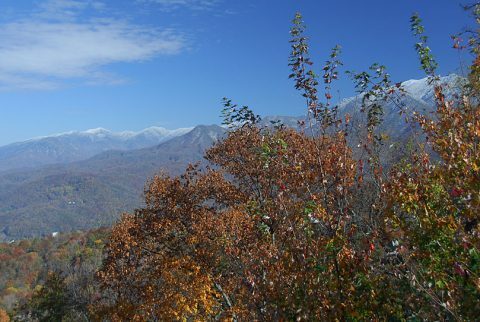 Book "Gatlinburg Splash" online today and save 15% on your luxury cabin vacation in the Smoky Mountains of Tennessee!